GE2015: Is this the final line-up of the SPP-DPP team for Bishan-Toa Payoh GRC? SINGAPORE-A leak of a mock-up of the election poster for the joint Singapore People's Party-Democratic Progressive Party Bishan-Toa Payoh GRC team may finally reveal the opposition slate for the five-member GRC. 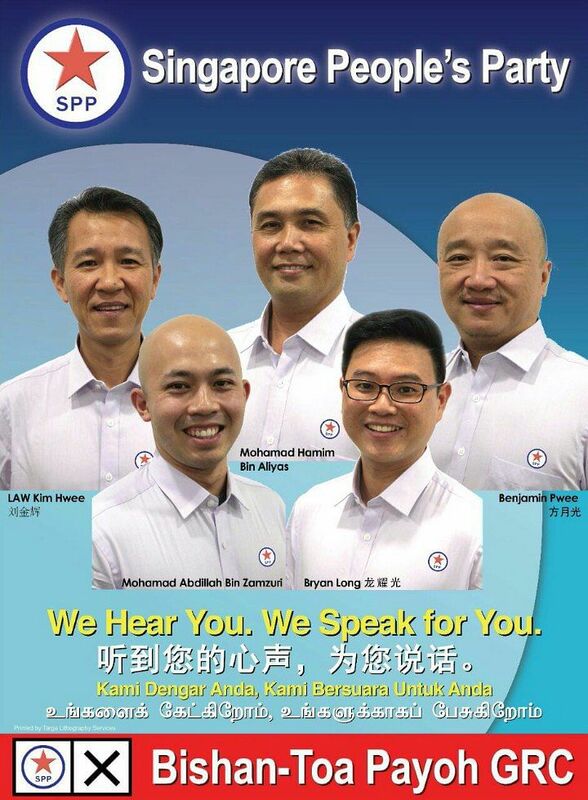 The poster features two Democratic Progressive Party(DPP) members - party chief Benjamin Pwee, 47, and chairman Hamim Aliyas, 50 - and three Singapore People's Party members: former sales and marketing manager Law Kim Hwee, 55, training company owner Abdillah Zamzuri, 31, and entrepreneur Bryan Long, 37. The three SPP members are newcomers to politics while the two DPP ones contested in Bishan-Toa Payoh GRC in 2011. The poster also reveals what could be the team's election slogan: "We hear you. We speak for you." The two sides are said to have been tussling over the make-up of the team in recent weeks but appear to have come to an agreement. Sources say today was the last day for the parties to make up their minds if they intend to have their election posters printed in time for the start of the election campaign period next Tuesday. Neither side have confirmed the contents of the poster on Thursday though SPP chairman Lina Chiam told reporters at the Elections Department earlier in the day that her team for this election campaign is "as strong as can be". She said the Bishan-Toa Payoh team will be revealed on Nomination Day. When asked about the leak of the poster, Mr Pwee told The Straits Times: "We are surprised that one of the draft posters actually went online. We went through at least five different drafts and permutations as we discussed with SPP. Ultimately we will leave it to SPP to make the final announcement as to who the actual five-man team is." In 2011, a five-man SPP team led by veteran opposition leader Chiam See Tong won 43.1 per cent of the vote in Bishan-Toa Payoh GRC.